Cost of Dog Ownership: What You Must Know? Can you afford that cute little puppy in the window? The cost of dog ownership is really important when picking out the right breed and dog for you. And it's not just the cost of buying the dog, his bed, bowls and toys. It's also the ongoing costs of food, veterinary bills, animal insurance, and general wear-and-tear on your house, furnishings and car. What will the breed of your dreams cost you over the course of his lifetime? A puppy has a good chance of living upwards of 10 to 15 years and some breeds live longer than that. 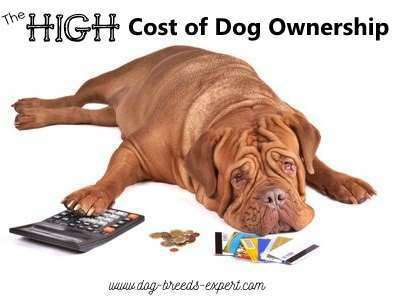 Unless you have unlimited resources, the cost of dog ownership should be significant to you. The cost of purchasing a puppy or adopting an older dog is just a small fraction of what is will cost over the lifetime of the dog to feed, house, and properly care for his health care needs. The larger the breed, the costlier it will be to purchase food, bedding, toys and equipment, grooming, and boarding. Size does make a difference for people on tight budgets. Expect to pay more for a puppy whose breed is rare in your area. Expect to pay more for a "show quality" puppy versus a "pet quality". Remember the "pet quality" pup is just as wonderful as a show prospect with one exception: He’s not likely to win in a dog show competition. So unless you want your dog to compete, a "pet quality" puppy should be on your radar. An example would be a Rhodesian Ridgeback puppy born without the ridge of fur on it's back. The dog will have all the traits of a Ridgeback, and be just like a normal Ridgeback, but missing the ridge of fur. He will be an EXCELLENT family pet, but not be suitable for the show ring. Puppies and Adult dogs from rescue organizations or shelters are going to cost much less than a puppy purchased from a reputable breeder. But they are not free, so don’t try to finagle a deal. Most rescue dogs have been vet checked, vaccinated, and wormed. Many are or will be spayed and neutered. Some have had their teeth cleaned if necessary and other procedures performed when needed. All in all, this is a good deal—it doesn’t get much better than this. Beyond the purchase or adoption fees, just how much does it cost to own a dog? According to the American Kennel Club, the average one-time expense for buying a dog is $2,100.00. This includes the purchase of the dog, spay, neuter and veterinary fees, costs associated with supplies such as leashes, collars, and dog bowls, tags, and training. After that, the average yearly cost of dog ownership averages $2489.00 per year. For someone on a tight budget, that is about $207.00 per month. What do you get for all that money? It is a somber day when a dog is relinquished to a shelter because the owner could not take care of all his needs. It is far better to know ahead of time just what it is going to cost than find out later on that there isn’t money in the budget for basic vet fees, food, and other necessities. The cost of dog ownership is not cheap. Food is one of the costlier items. Supermarket foods may seem reasonable, but what you don’t pay for in food, you will later pay for in veterinary fees. Cheap food is just not healthy for dogs and tends to create all kinds of health problems down the road. Just take a look at the ingredients list on a bag of cheaper food. The first item might be a protein source such as chicken, but that may be the only protein in the food. While whole chicken might seem like a healthy choice, consider that it is about 70% water. Once processed there is little left of the chicken. Most of the other ingredients are items that are cheap to grow and process such as corn, wheat or soy. Living on a diet that is mostly corn is not healthy for you or your dog. This list can grow very long if you add in other items such as more grooming tools, car restraints, additional training leashes and equipment, travel crates, and much more. Puppies can get very expensive very quickly. Very Basic Veterinary costs include vaccines, wormings, heartworm preventative, flea and tick prevention, office visit fees, and spaying or neutering. These necessary costs are for prevention only and do not include accidents or illnesses. According to the American Pet Products Association, a whopping $15.73 billion dollars were spent on Vet Care in 2015. They reported that the average person spends about $ $235 on routine vet care per year and another $551 for surgical vet visits. That totals approximately $786 per year per dog. So, do the math if you have more than one dog. That works out to about $65 per month just for vet fees. Pet insurance can help cover large expenses and for those who would not want to be in the position of choosing the life of their dog over the high cost of medical care, this is a real option. According to Pet Insurance Reviews, monthly insurance premiums can run the gamut from a low-end plan that covers accidents only at $3.59 per month to a comprehensive plan that costs upwards of $76.00 per month. Pet insurance is not cheap and does not cover all expenses. It does give you peace of mind and will help cover those large unexpected vet bills that can arise over the lifetime of your pet. It is advised to do your homework before settling on an insurance plan. You could go to each insurance company and read their policy, take notes and then compare. One company has done that for you. The pet insurance review compares and rates companies based on rates, copay, coverage, customer service, length of time for pay out and how reimbursement costs are calculated. This is also a great article for those not familiar with different terms used in the industry. If you are on a tight budget, it pays to create a budget long before the big day arrives. Search the internet and visit a couple of pet stores. Write down the prices of some of the items you are likely to need. According to the 2015-2016 APPA National Pet Owners Survey, some additional pet expenses have been averaged. Total Costs of Dog Ownership? When added together, this totals $1641 per year. Bare in mind that some of those figures are very low such as the grooming fee. If you choose a breed that needs professional grooming every two months, that fee is going to go up exponentially. Food is also a big expense. The bigger the dog, the higher your food budget. If you choose to offer a premium brand of food, expect to double or triple that figure. So when you see a puppy being advertised for $1200 and you think that fee is totally outrageous, consider that the cost of the puppy is just the beginning. I have often thought that the cost of dog ownership mirrors that of human children. This is not the case, but they have their fair share of expenditures. "I want a dog but all I have is $200 to spend. I love dogs and I will give him a good home, but I don’t have money to buy or adopt. Can you tell me where I can find a dog free to a good home?" Without the ability to pay for the adoption, there is an excellent chance that there won’t be enough money to cover expenses, especially the more expensive ones such as veterinary costs, food, grooming, and training. National Council on Pet Population Study and Policy (NCPPSP) did a study on why pets are given up. According to the results, approximately half of the pets (42.8% of dogs) surrendered to shelters and rescues were not neutered. Many of the pets relinquished (33% of dogs) had not been to a veterinarian. I wonder what else these owners discovered about costs after they brought their dog home for the first time. "I would never spend that much on a dog." Arrange to swap pet babysitting to save on kennel costs. Take good care of your dog to avoid costly visits to the vets. Some of the most common vet visits are totally avoidable. If you are crafty, make your own dog beds, blankets, toys, and sweaters. Research dog foods and chose the highest quality you can afford. Purchase in bulk if practical and order online for automatic shipments. "What do costs have to do with picking out a dog breed?" Consider the breed you might choose. Is it a giant breed? Expect to pay more because everything is more expensive when you must super-size it. Is your dream dog a fluffy long haired breed? Unless you are a pet groomer, expect to spend plenty on keeping your fluff ball looking and smelling fresh. Is that breed you are considering a challenge to train? It is great if you have an advanced degree in animal behavior, but for the rest of us, expect to spend some money getting professional help with training. If that breed of choice is highly energetic and you work full-time, add in the costs of dog walkers or doggie daycare. Consider costs associated with repairs. Yes, this is a topic you don’t want to think about as you are choosing that sweet little puppy, but dogs can be destructive until fully trained. Digging, Scratching and Chewing behaviors can lead to major repairs or replacements for woodwork, furniture, upholstery, carpets, blinds, well, the list goes on. Remember that it might cost upwards of $200 per month to own a dog. If you don’t have this amount currently in your budget, consider another type of pet, or hold off until you are fully financially ready to give a dog or puppy a new home.